Think about the last thing about this world that you felt angry about. Think about it until your face gets hot, your hands clench, your eyes burn, your head gets stuffy, and you feel you just might burst from pressurized rage storming in the confines of your skull. No go make a work of art. What will you do with your artwork? Hang it in a gallery? Why would you do such a thing? Be honest with yourself: Do members of the common populace often find their way to art galleries? Hint: the answer is no. America, for all its glories, has a flagging appreciation for the arts amongst the greater population, preferring instead a main-lined diet of popular culture, brand worship, and celebrity gossip. If you want to get your art into the hands of the people there are only two routes to go: the internet or the street. The internet will get you instant globalization, but no profit, and street art and graffiti can be dangerous or illegal to produce. In the last decade, there has been a rising trend stemming from such problems as faced by contemporary artists who have a message they want to spread – moving billboards sold at twelve dollars a pop, screen printed in garages or studios and spread through boutiques and on street corners—protest t-shirts. 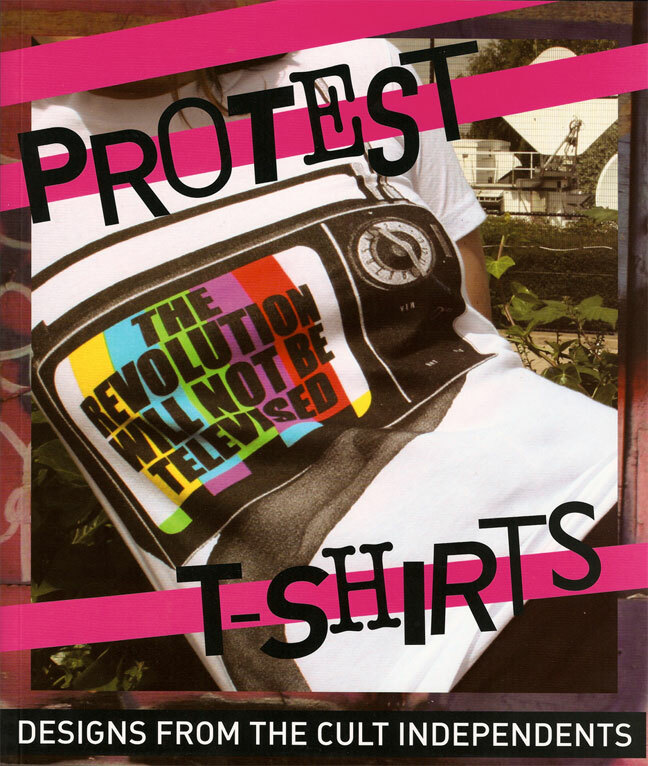 The book “Protest T-shirts: Designs from the Cult Independents” Edited by Eleanor Mathieson and published by Graffito books is a comprehensive representation of the myriad of revolutions and revolutionists alive in world-society today. Boldly designed in high contrasted color and magazine-like spreads of images, it lists 56 independent t-shirt sellers and over 200 t-shirt designs meant to rock, poke sly at, mock, and call attention to their creator’s causes. 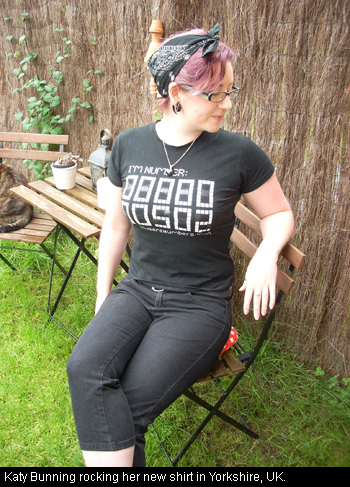 The set-up is simple: The designers, listed by name or studio or group, are presented in a two to three page collection that displays not just their more revered and intriguing shirts, but a short paragraph on the group’s ideals, goals, and meanings behind their artwork. There is no logical arrangement of who-follows-who, perhaps a nod to the idea that no cause is more worthy than another, even though there are obvious broad-categories for which each designer’s protests can be placed. These protests range from war, to consumerism, nature and animal activism, humanitarian outreach, historical fact, and racial anti-propaganda. Kiser Haydar Barns from New York, USA, designer of anti-war shirts that reflect some of his background being raised mainly in the middle-east, explains that “our work tends to start off as art and then make its way into a commercial form, versus many brands who start off with a commercial idea then try to make it creative.” Kiser’s work is graphic and dynamically appealing, mixing images relatable to war in the middle-east, ideas of peace, and powerfully simple slogans such as “Peace” and “Never do what they do”. His words and work exemplify the meaning behind the t-shirt as propaganda movement: create art that is beautiful, thought-provoking, and meaningful to a deeper level of thought, and then allow those of similar mind to take this art out into the world, emblazoned over their very chests.